When aboard an airplane flying at cruising speed, we will not be able to feel that the plane is, in fact, moving at speed of more than 900 km/h. But if the plane changes its speed, turns or changes its altitude, we can easily feel it. The same thing happens with the motion of the Earth. Due to Earth’s rotation, the surface of the Earth is moving at 1656 km/h near the equator. We never feel it because the speed is constant, or in other words, the acceleration is zero. A constant circular motion, like Earth’s rotation, has another component in addition to the constant motion. It also has the centripetal acceleration. To a person in the rotating frame of reference, they will feel the centrifugal acceleration toward the outside. Earth’s rotation generates a centrifugal acceleration of about 0.03 m/s² near the equator. 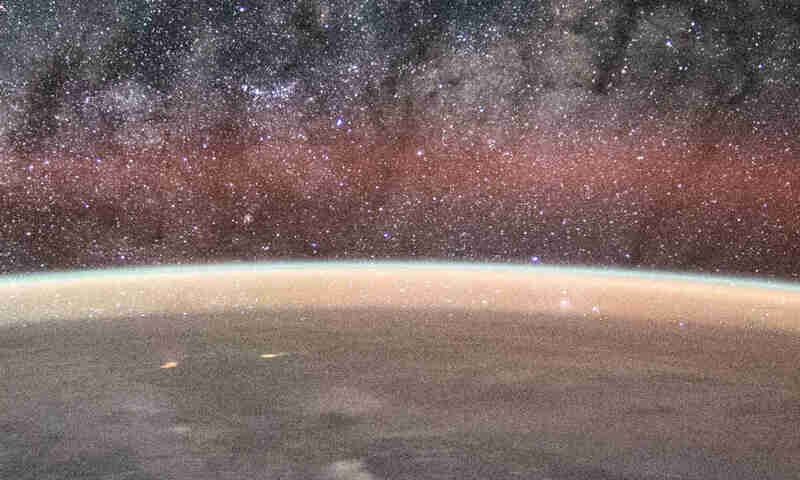 We feel this centrifugal acceleration simultaneously with Earth’s gravitational acceleration. In fact, in the majority of cases, the figure of 9.8 m/s² we use to describe Earth’s gravitational acceleration already accounts for this centrifugal acceleration. Without the sensory input from sight and hearing, we can feel acceleration, but not speed. We feel acceleration through our vestibular system in our inner ear. Using the vestibular system, we can maintain balance when upright, and determine which way is up even while blindfolded. To determine the plane is actually flying at such speed, we have to use our sense of sight. We can look out and observe the objects outside are in fact moving, indicating the plane we are in is actually moving. During the entire flight, we could refuse to look outside from the window, but obviously, we cannot conclude that the plane is not moving and that the other passengers that look outside from the window are all wrong. Nesti et al (2013) summarized the results of several experiments. The conclusion is that the lowest acceleration we can perceive is 0.02 m/s². Earth’s rotation will result in centrifugal acceleration about 0.03 m/s² near the equator. It is very small compared to Earth’s gravitational acceleration, and we feel both accelerations simultaneously. In many cases, the centrifugal acceleration is, in fact, already accounted for in the magnitude of Earth’s gravitational acceleration or 9.8 m/s². The orbit of the Earth around the Sun will result in the centrifugal acceleration of about 0.006 m/s². It is far below our limit to perceive it. In addition, we are orbiting the Sun, and thus, in free fall with respect to the Sun. We and everything around us are getting the same acceleration from the Sun, and thus, our centrifugal acceleration due to Earth’s orbit is zero when measured relative to our everyday frame of reference. According to Kepler’s Law, an object orbits with the shape of a conic section, and its speed changes according to its position in the orbit. In case of the Earth orbiting the Sun, the average acceleration resulting from this orbital motion is about 0.0000635938 m/s². It is a very small acceleration, way below the limits of our senses to perceive it. And the same thing applies as above: we are in free fall with respect to the sun. Everything around us is getting the same acceleration from the Sun, and thus, our acceleration due to Earth’s orbit eccentricity is zero when measured relative to our everyday frame of reference. 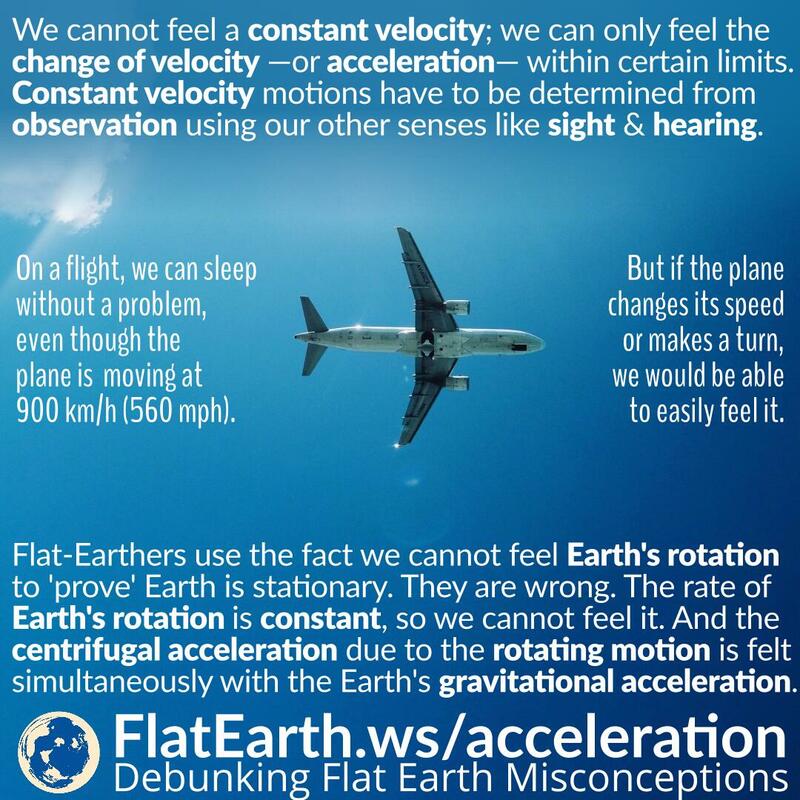 Some flat-Earthers reject the analogy of airplanes because the air inside the plane is ‘separated’ from the outside air, while the atmosphere of the Earth is ‘not separated’ from space. The reasoning is flawed because Earth’s atmosphere also rotates along with the surface of the Earth. If not, then we should be feeling the wind at speeds in excess of 1600 km/h around the equator! The analogy of being a passenger of a plane is correct because the air in the cabin also moves along the plane. The same thing happens with Earth and its atmosphere.